A beautiful and top quality fine dining restaurant. The service was top standard and the food was delicious with unique touches. 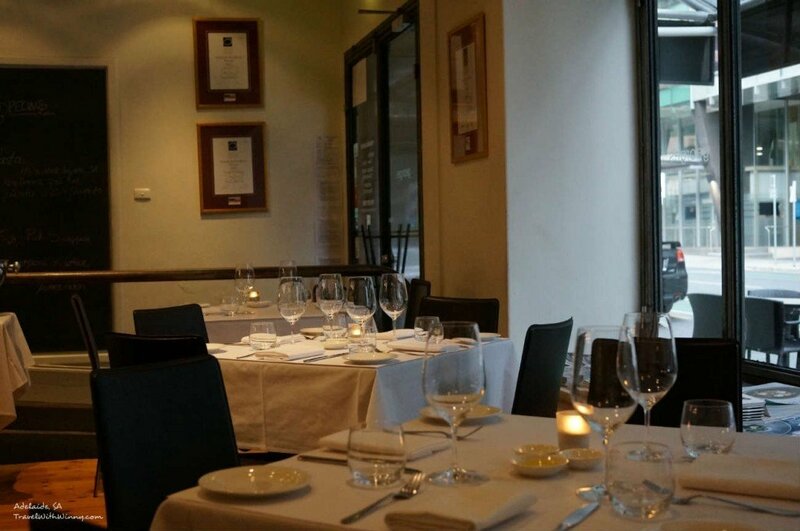 It has been a while since we last had fine dining and so on our day off we visited a popular Adelaide fine dining restaurant named Georges on Waymouth. Many of our friends have been to this restaurant before and have said many good things about this place. We arrived at the restaurant at around 6:00pm on a Wednesday night and we were the restaurant’s first customer. The restaurant then progressively filled up and was full by around 7:00pm. Stylish and minimalist interior with high ceilings and wooden floorboards. The place is quite big with an upper deck seating area. The area looked quite elegant with white clothed tables, candles and well spaced out seating. It is a good place for a date. The service here is definitely one of the best in Adelaide. 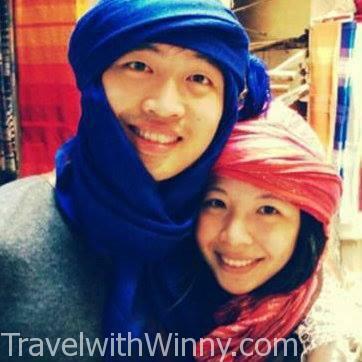 As soon as we entered the restaurant, a waiter immediately rushed over to greet us. He remembered my booking without checking and took us to our table. The waiter/waitresses were quite professional, before each meal gets presented, they would always prepare sharing plates because we told him that we were sharing the meals. They did their rounds of the tables quite frequently and our water glasses were never empty. All of them made an effort to make interesting small talk but left us to have our private conversation quickly. 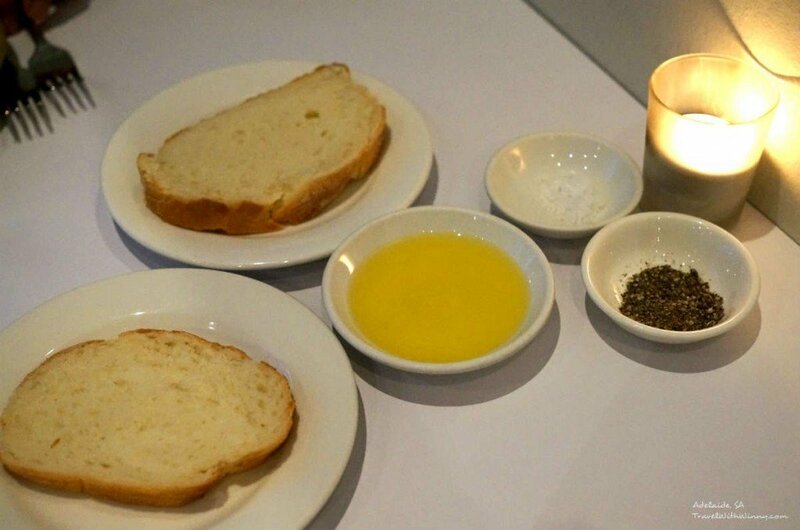 The complimentary bread was still warm because it came straight from the oven. The bread was quite simple with a soft inside and a crusty outing. Not the best complimentary bread but it is a lot better than most breads we have had at other fine dining restaurants. 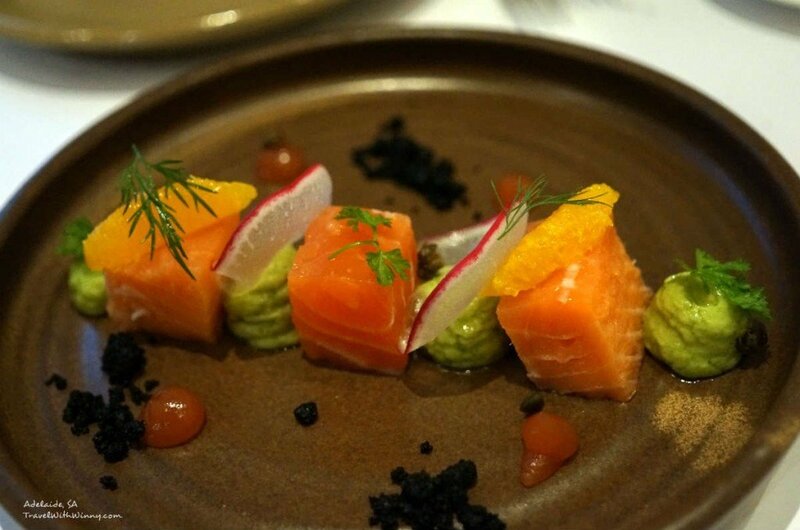 The entrée dish we had was slow cooked Tasmanian Salmon with radishes, citrus, avocado and Kalamata soil. This entrée came with a generous portion and it was delicious. The Salmon was cooked to perfection. It was closer to raw than cooked but didn’t have the raw taste and the texture of the meat was tender and slightly chewy. The citrus and avocado sauce mixed in perfectly with the salmon, leaving us wanting more after each bite. It was an extremely refreshing dish and is standard that you’ll expect from a top quality restaurant. 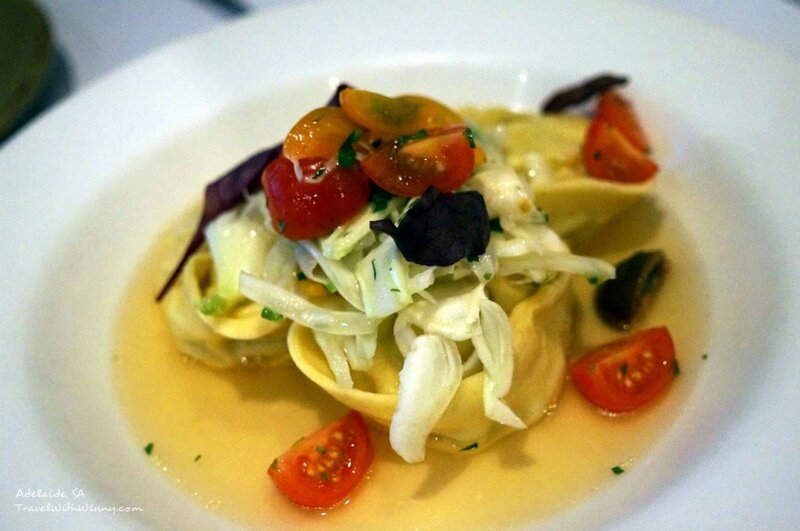 The first of the main was blue swimmer crab & snapper tortellini, heirloom tomatoes, fennel and tomato consommé. This dish was closer to a soup than pasta although it was listed as pasta. The dish was served with three huge tortellini served in a clear and quite sour tasting soup. The huge tortellini had freshly made pasta wrapped around the snapper and crab meat that was flavoured with fennel. The meat of the tortellini was nice but does not have the seafood taste as expected. The mixture of the meat had a fish paste consistency and was tasty with the flavourful sour soup. It was quite different to what we had in mind and we were a little disappointed because we couldn’t quite taste the crab but overall it was a nice dish. 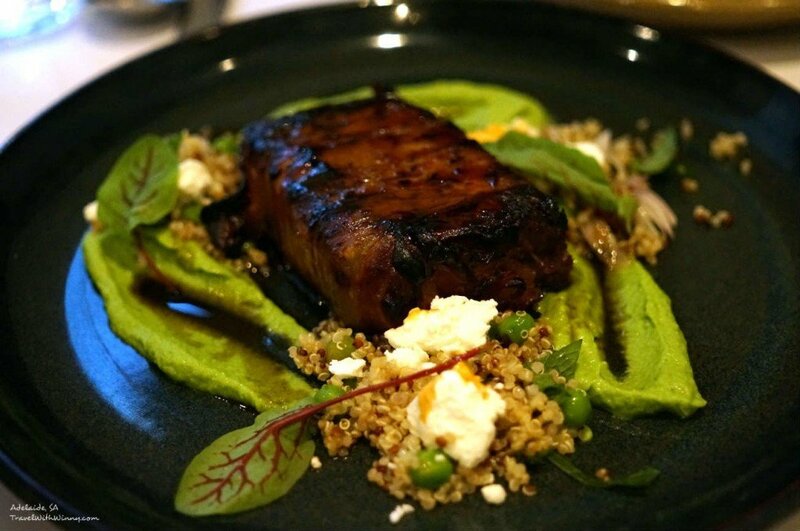 The second main was Hay Valley lamb press with Pancetta, pea puree, quinoa, shallots and goats cheese. The Lamb press was quite impressive with tender meat cooked in a delicious sweet sauce. The meat falls apart when we cut through it. The sauce was delicious. The creamy texture of the pea puree and the nuttiness of the quinoa mixed in with the goat’s cheese was a beautiful match with the tender lamb. It was an enjoyable dish and left us wonder what the other mains would taste like. There was one side that caught our eyes on the menu. The description looked refreshing and it tasted very refreshing; fit for their summer menu. 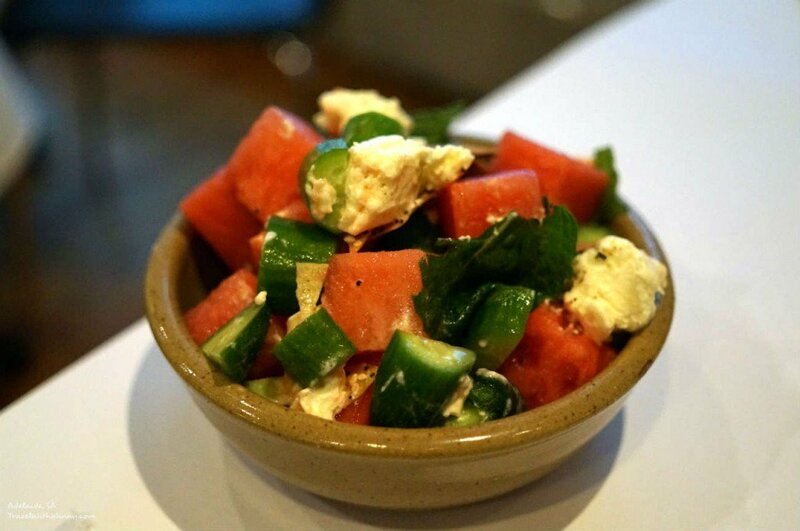 The side has Watermelon, feta, cucumber, mint and lavosh. It’s not an extra ordinary dish but the combination was not something I have come across. The creamy cheesy feta brings all the refreshing ingredients together which makes the dish a worthy side in the restaurant. It isn’t a difficult dish to make and I may try to make it at home next time. We finished off with a desert that had smoked chocolate with chocolate brownie, hazelnut mousse and blackcurrant. This desert was very unique. 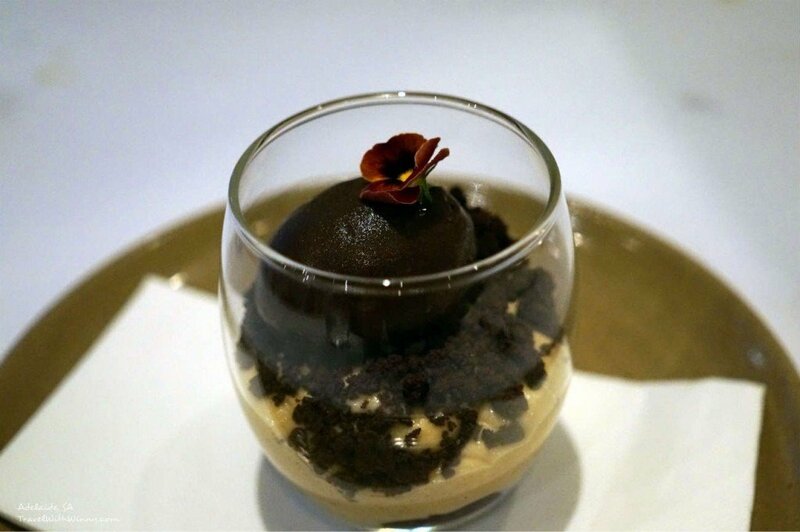 The appearance of the desert seemed normal but tasted very delicate. Overall the desert wasn’t very sweet and this showed the quality of the coco they used for the smoked chocolate. The nutty taste of the hazelnut compliments the chocolate taste and the brownie. Although we were quite full from our main meals but we ate every bit of our desert which we loved. 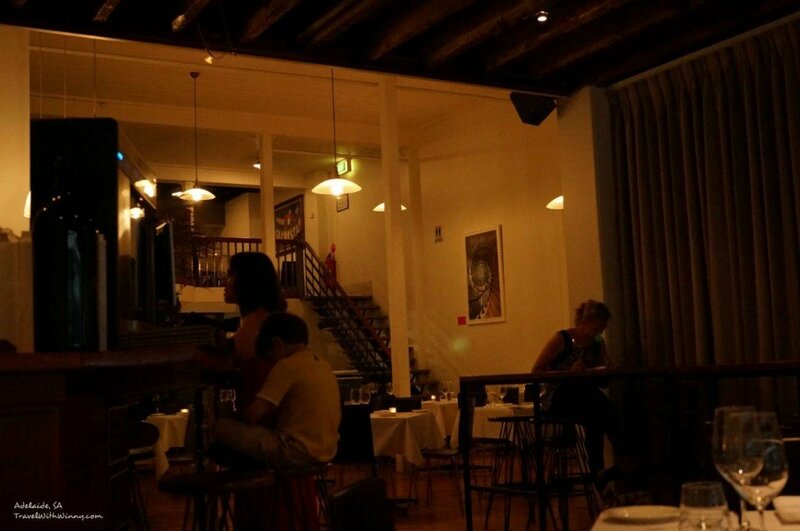 We had quite high expectations for Georges on Waymouth and it did exceeded that expectation. I am glad that Adelaide still has restaurants like these to go to when we want quality fine dining. Although the price isn’t cheap but we definitely felt like the quality was worth it. We will definitely be back to try other dishes or when they change their menu. The waiter said that they change their menu each season.